There are so many complex mechanisms that occur in DNA and RNA production but the DNA replication is one of the most outstanding indicators of Intelligent Design. The rate of DNA replication has been measured at a massive 749 nucleotides per second (McCarthy et al., 1976) and the error rate for accurate polymerases is believed to be in the range of 10^-7 thru 10^-8, based on studies of E. coli and bacteriophage DNA replication. NOTE: I’ll try to keep this post as coherent for layman as possible but it may serve useful to have google on hand. Each of the two strands of DNA serves as a template for the biosynthesis of a new daughter strand [That is, partially conservative]. This leads to having two new helices produces each containing a new and old strand. 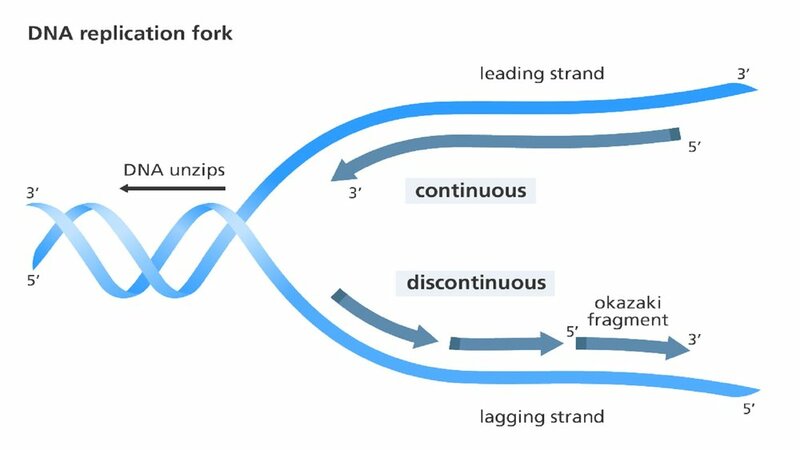 A fork then occur, DNA replication begins at certain sites known as origins of replication (ori). Since the replication machinery pushes away from the origins of replication in two directions, a “replication bubble” is formed. At the origins of replication, the DNA double helix is opened and unwound on either side. This forms what is known as “replication forks.” These replication forks then progress along the DNA in opposing directions, as DNA biosynthesis starts to occur. The next phase or the imitation phase is a process that is specific regulations that ensure that it happens no more than one time during cell-division. This is where the helix opens and a single strand is exposed by an initiator protein. This protein is connects with specialized helicases which are responsible for unwinding the DNA. Two protein complexes, the clamp loader and sliding clamp, are responsible for forming the DNA polymerase and making sure that it remains in close proximity with the DNA. The clamp loader is responsible for loading the sliding clamp onto the DNA itself. After enlisting the DNA polymerase, the sliding clamp quite literally pushes with the DNA polymerase as it moves along the DNA template, keeping them firmly clamped together. After the synthesis of primers and the leading and lagging strands phases are completed in sequence (for more, see image) you find the process of relieving the DNA supercoiling. At this point, the DNA helix have polar opposite orientations which seemingly raises a difficult and stressed situation. DNA supercoiling is brought on by the torsional stress generated by the polymerases and helicases. Strand separation can then be partnered by DNA over-winding. A class of enzymes called Topoisomerases relieves this torsional stress by breaking the DNA spine and relaxing the supercoils. The DNA spine is then folded back together. In so doing, this class of enzymes removes the supercoils. There are other process that take place within the replication of DNA but when you read through the systems and processes of this, how can you plausibly deny the role of intelligence in them? There is far too many specific mechanisms that occur for this to be random, by chance or unguided. The systems responsible for DNA replication are well beyond the explanatory efficacy of unguided processes involving chance and necessity. There isn’t a process like this in the universe by which a reasonable mind can establish it is by chance. I previously mentioned the cyber security example and that is one of the best I can think of. You have machine learning defense mechanism that are, in comparison, “cute” to that of DNA replication. This absolutely infers that there is an intelligent designer.